For the WHL ice hockey team, see Calgary Stampeders (ice hockey). For the WIHL ice hockey team that played the 1978–79 season, see Calgary Stampeders (WIHL ice hockey). The Calgary Stampeders are a professional Canadian football team based in Calgary, Alberta, competing in the West Division of the Canadian Football League (CFL). The Stampeders play their home games at McMahon Stadium and are the third-oldest active franchise in the CFL. The Stampeders were officially founded in 1945, although there were clubs operating in Calgary as early as 1909. The Calgary Stampeders have won eight Grey Cups, most recently in 2018, from their appearances in 17 Grey Cup Championship games. They have won 20 Western Division Championships and one Northern Division Championship in the franchise's history. The team has a provincial rivalry with the Edmonton Eskimos, as well as fierce divisional rivalries with the Saskatchewan Roughriders and the BC Lions. Fight Song: "Ye Men of Calgary"
Prior to the formation of the Calgary Stampeders, football in Calgary can be dated back as early as 1909 and the Calgary Tigers of the Alberta Rugby Football Union. The following years saw Calgary based teams come and go these included the Calgary Canucks, the "Fiftieth Battalion", the Tigers again, then the Calgary Altomahs, and finally the Calgary Bronks of the Western Interprovincial Football Union. These teams were a dominant force in football in Alberta winning championships 15 times over the next 30 years. World War II brought a halt to football in Calgary for a few years. 1940 was the final year for the Bronks. The WIFU returned to Calgary on September 29, 1945 with the formation of the Calgary Stampeders. In their very first game played on October 20 at Mewata Stadium they beat the Regina Roughriders 12–0 before 4,000 fans in attendance. It was a taste of success to come that decade under the direction of head coach Les Lear and talented stars such as Woody Strode, Paul Rowe, Keith Spaith, Dave Berry, Normie Kwong and Ezzert "Sugarfoot" Anderson. The year 1948 was perhaps the greatest season in Stamps history, achieving a perfect regular season of 12–0 and capping the year a 2-0-1 record in the playoffs including a Grey Cup victory over the Ottawa Rough Riders at Toronto's Varsity Stadium. It was also during that same Grey Cup festival that Calgary fans brought pageantry to the game and made it into a national celebration, featuring pancake breakfasts on the steps of City Hall, starting the Grey Cup parade and even riding a horse in the lobby of the Royal York Hotel. They returned to the Grey Cup the following year (1949), with a 13–1 record but lost to the Montreal Alouettes 28–15 in the title game. It was 19 years until Calgary once again reached the Grey Cup, losing 24–21 to Ottawa in the 1968 final and not until 1971 when they were crowned champions, defeating the Toronto Argonauts 14–11. The Stampeders, like all the teams playing in the WIFU and IRFU, joined the newly-formed Canadian Football League in 1958. The year 1960 brought the Stampeders a new home, McMahon Stadium. Their first game in their new stadium was on August 15, 1960, a 38–23 loss to the Winnipeg Blue Bombers. From 1968 to 1971, the Stampeders made it to the Grey Cup game three out of those four years (missing in 1969), winning it in 1971. After having some great years at the end of the 1960s, 1972 started a long period of struggles for the Stampeders. In the 18 seasons from 1972 to 1989 the Stampeders only made the playoffs 7 times, and were the only CFL team that did not win a playoff game during the 1980s (the team made five appearances during the decade, all but one of which came on the road and all resulting in losses in the West Semi-Final). The Stampeders nearly folded after the 1985 season due to years of declining attendance, financial woes and a poor 3–13 record. However, a successful Save Our Stamps campaign in 1986 resulted in season ticket sales of 22,400, additional funds and stability that translated to improved on-field play which laid the groundwork for Grey Cup berths in 1991 and 1992 when they won the title over Winnipeg. Wally Buono took over the head coaching duties in 1990 (after having served as an assistant coach for the previous three years). Late in the 1991 season, the team, after being community-owned since its inception, went private when Larry Ryckman purchased the team. The next 13 years would be some of the most successful years in Stampeders history. Led by quarterbacks Doug Flutie, Jeff Garcia, and Dave Dickenson receivers Allen Pitts, Terry Vaughn, and Dave Sapunjis, and a rock steady defence led by Western All Stars Alondra Johnson, Stu Laird, and Will Johnson the Stampeders would rack up a 153–79–2 record during these years. They reached the Grey Cup six times, winning in 1992, 1998, and 2001, losing in 1991, 1995, and 1999. In 1996, Ryckman was found by the Alberta Securities Commission to have run a stock manipulation scheme, was fined $492,000 and was forced to give up the Stampeders, who were subsequently purchased by Sig Gutsche via a receivership court for $1.6 million on April 3. On October 8, 2001, Sig Gutsche sold the team to California businessman Michael Feterik. Unlike previous owners, Feterik was intimately involved in the club's football operations. Feterik's most notorious move was to give the starting quarterback position to his son Kevin Feterik, angering both fans and Buono. Buono left to join the BC Lions after the 2002 CFL season. After Wally Buono departed from the Stampeders, the team went through three different head coaches in three years. Jim Barker succeeded Buono in 2003, but was let go after a 5–13 season, and he was replaced by Matt Dunigan, who fared no better in his lone season in 2004, going 4–14. The coaching carousel ended with Tom Higgins taking over in 2005, who brought the team back to respectability led by Henry Burris at quarterback and Joffrey Reynolds at running back, but lost in three straight years in the 2005, 2006, and 2007 Western semi-final games in that span. During this time, the team lost money, and in January 2005, Feterik sold the team to a group led by Ted Hellard, Doug Mitchell and former Stampeder John Forzani, and the Calgary Flames Limited Partnership, the organization that represents the NHL's Calgary Flames. In 2008, one-time Stamps QB John Hufnagel took the coaching reins, and the Stampeders ended their playoff victory drought en route to winning the team's sixth Grey Cup 22–14 against the Montreal Alouettes. Burris was named the Grey Cup Most Valuable Player with DeAngelis being the top Canadian for their efforts. John Hufnagel had been interviewed by several NFL and college football teams, but is still the team's general manager to this day. Hufnagel was also the team's head coach until the end of the 2015 season, when he turned over the head coaching duties to former Stampeder and BC Lions star Dave Dickenson. Between 2009 and 2014, the Stampeders have reached the Western Final every year except 2011, when the team lost the semi-final game to the Eskimos in Edmonton, 33–19. The following year, the organization by now known as Calgary Sports and Entertainment became the majority owner of the team; the company previously only had a 5% stake in the team. They were able to reach the Grey Cup game that year only to come up short against the Argonauts, falling by a score of 35–22. Following another heartbreaking defeat in the Western Final in 2013, the Stampeders were once again able to reach the Grey Cup the following year. This time, they came out on top with the franchise's seventh championship, defeating the Hamilton Tiger-Cats 20–16. After the 2015 season, Hufnagel stepped down from his dual responsibility as head coach and general manager, becoming purely a general manager and handing the coaching reins to former Stamps QB Dave Dickenson. The Stamps continued their success in 2016, winning the West Division again with a 15–2–1 record, but falling to the third-year Ottawa Redblacks in the 104th Grey Cup in overtime. In 2017, the Stampeders finished 13-4-1 (with the league's best record for the season) and made their second straight Grey Cup appearance, but lost to the Toronto Argonauts again, just as they did five years earlier. In 2018, the Stampeders would finish 15-5 and would make a third straight Grey Cup appearance, this time winning the title over the Redblacks 27-16 in Edmonton. Bo Levi Mitchell would win Most Outstanding Player at the 2018 CFL Awards as well as the Grey Cup Most Valuable Player. Lemar Durant was named the game's Most Valuable Canadian. The Presidents' Ring was established in 1967 by Calgary Stampeders Football Club team president George McMahon and general manager Rogers Lehew. Formerly presented to the team's most valuable player, it is currently awarded to the player who best demonstrates leadership ability. As of 2012[update], 29 players have won the award, including three-time winners Henry Burris, Danny Barrett and Stu Laird. The Stampeders Wall of Fame recognizes the greatest players and most important off-field contributors in Stampeders history; it was Instituted in 1985. 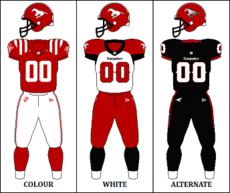 ^ "Calgary Stampeders Club Profile & History" (PDF). 2017 CFL Guide & Record Book. Canadian Football League. Retrieved December 1, 2017. ^ "Stampederes Unveil New Adidas Uniforms". Stampeders.com. CFL Enterprises LP. May 12, 2016. Retrieved June 8, 2018. ^ "Internet Archive Wayback Machine". 2011-04-29. Archived from the original on April 29, 2011. Retrieved 2012-12-01. ^ "A Turning Point 25 Years Ago". calgarystampeders.com. Calgary Stampeders. December 22, 2016. Retrieved February 11, 2018. On Oct. 23, 1991, with the threat of the franchise's extinction still looming menacingly, the Stamps were privatized under the ownership of Larry Ryckman. ^ "Stamps Story". stampeders.com. Calgary Stampeders. Retrieved February 11, 2018. Calgary businessman Sig Gutsche, through a successful bid, became the club's second private owner. ^ Constentino, Frank (2014). Home Again. In Calgary, Larry Ryckman left the scene. Sid Gutsche purchased the Stampeders on April 3, 1996. Ryckman had been penalized by the Alberta Securities Commission for stock manipulation, fined $492,000 and banned for 18 years from trading in stock in Albert and "prohibited from being an officer of any Province-based company which would presumably include the Stampeders." ^ "Gutsche sells Stamps to Feterik". www.oursportscentral.com. OurSports Central. October 8, 2001. Retrieved July 20, 2017. ^ "How Stampeders Ownership Made Calgary into a Model Franchise". 2016-02-21. ^ Maki, Alan (1982-11-17). "Stamps zero in on Reeves". Calgary Herald. p. D2. Retrieved 2013-10-15. ^ Busby, Ian (2010-06-29). "Familiar faces among Stamps' captains". Calgary Sun. Retrieved 2013-10-15. ^ "Raymond wins second President's Ring". Calgary Stampeders Football Club. 2013-05-02. Archived from the original on 2014-07-09. Retrieved 2013-10-15. Jim Finks as 1960 interim coach: Toronto Globe and Mail, Saturday 20 August 1960, p. 21, "Calgary Coach Resigns".